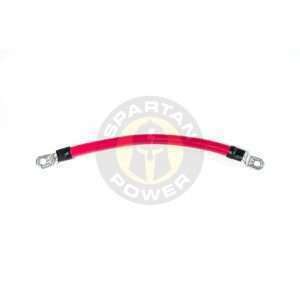 We carry the Spartan Power line of 4/0 AWG battery cables. These 4/0 gauge cables should be used on larger power inverters such as 3500 watts and higher or on heavy duty RV & vehicle wiring applications, grounding cables, golf cart wiring, and many other applications where pure copper is recommended. Great when putting batteries in series or parallel to form a battery bank. 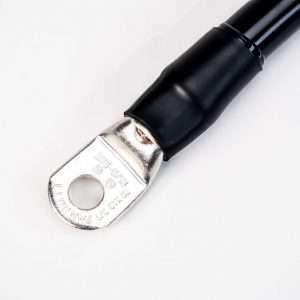 These 4/0 AWG gauge battery cables or wire come with 5/16″ ring terminals, if you would prefer a larger size, simply let us know and we can accommodate your request. 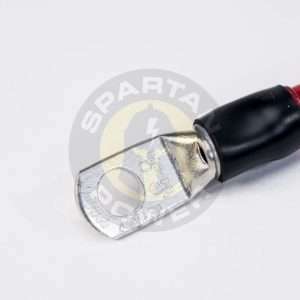 The 5/16″ ring terminals are a great fit when used in conjunction with the 500A Spartan Power Fuse Kits as those kits come with 5/16″ posts. If you have a question concerning what size 4/0 AWG battery cable to use with a certain inverter, please do not hesitate to call us at 866-419-2616.